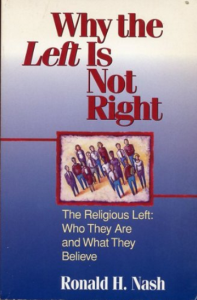 This book is subtitled “The Religious Left: Who They Are and What They Believe.” It is a critique of liberal political action taken by left-wing evangelicals including socialist and communist connections within the WCC and NCC. I was pleasantly surprised that Nash takes the conservative stance he does while criticizing fellow evangelicals. Of special interest in this book is detailed information on Tony Campolo’s left-wing political and religious ties, and a long chapter on President Bill Clinton’s connection to Southern Baptists in Arkansas as well as his responses to the super-liberal Foundry United Methodist Church in Washington. Interestingly, this is a church from which Bob Dole withdrew his membership because of the same liberalism.